Cynthia comments: I think many of us write about the weather because it is a grounding element. No matter what else is happening in our lives the weather is always there, and yet it is always changing. Odd dichotomy: steady, but mutable. It can usually be described without much angst (notable exceptions here), and it can be peaceful, beautiful. Nature may not always be idyllic but it can be entertaining and very interesting. 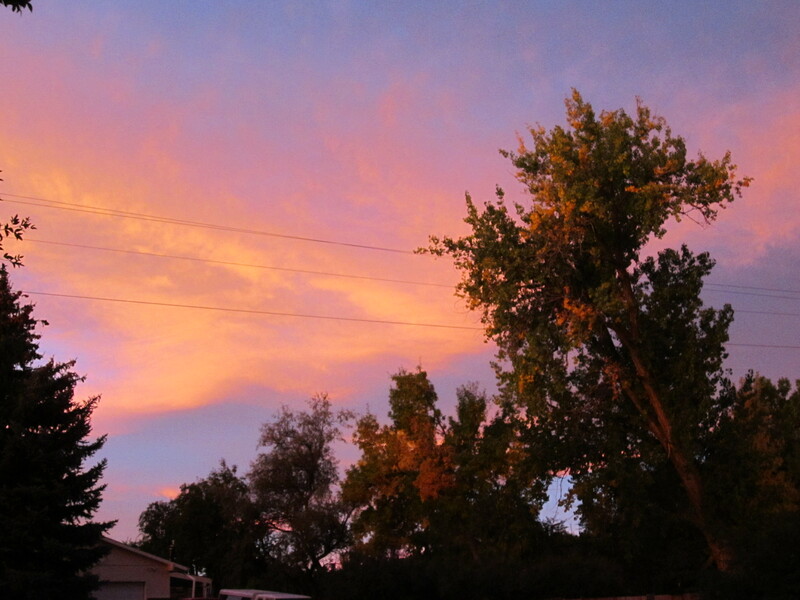 This photo is a sunset on my farm in Colorado, October 2013. Years ago I read in a literature anthology that New England writers never felt comfortable in writing about the emotional and sexual life, but nature, given by god, was an open field for their enthusiasm and desire. If that is the case then I have a major work of sublimation in my years of writing about the weather. I write about nature as much as possible. It is the one subject I never tire of. I do read the nature writers with profound pleasure and appreciation. Every new day brings another page of wildflowers, clouds and trees. Writing about nature has made me mindful of what I love and brought me closer to it. From my very first diary in 1971 I began to notice trees and rocks and open fields. I don’t do much more than describe nature, over and over again. I can’t explain it. I’m not a scientist nor do I have the bent of mind that wants to know everything we can know about a plant or a landscape. I do learn from such material but as a writer I just like to write about being there in the moment. Many of my pages are descriptions of walks I take along the shore or through local parks and neighborhoods. Many of the pages are even closer to my home looking out the window as I write or sitting under the maple tree and surveying my garden. I can’t even tell you why I do this and why it means so much to me. Perhaps because I am completely free to indulge this sensual pleasure without guilt, morality or judgment. So much of it is connected to childhood delight. I grew up on a quarter acre lot next to a brook in the industrial city of Bridgeport, Ct. The contrast between nature and factory streets fascinated me and dominated my imagination. If you take nature out of my diaries they would probably shrink by half. This is one reason I write in diaries. I can write about nature every day and damn well do as I please without an editor’s permission. It is my love and my reason for writing. The most accessible part of my imagination and my emotional life. This isn’t to say that I don’t write about family, travel, reading etc. but everything starts with a look out my window or a foot on the pavement.